Duke story starts on November 8, 1998. We had actually never seen Duke before that Sunday morning though he slipped by the "rules" because we did see some of his owner's other animals regularly. Duke's "dad" called and said that he was in bad shape: he had just been shot. When he arrived he was bleeding from everywhere. His "color" was awful, he was in pain, he was in respiratory distress and he was actively bleeding from multiple gunshot wounds. It was clear that he had a fractured jaw, a fractured front leg and problems with air exchange. 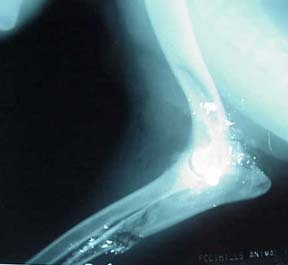 The damage to Duke was a little confusing and the first set of radiographs made it a little more confusing. 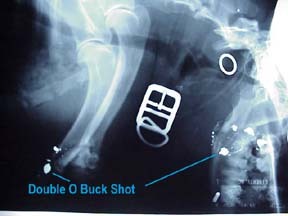 We knew from the owners report that Duke had been shot at close range with a 12 gauge shotgun with double O (Buckshot). However, in addition to that there was a large caliber rifle bullet present and lots of little bird shot. 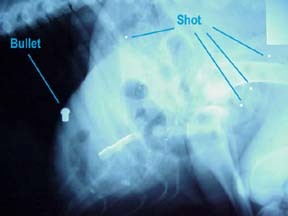 The buckshot had shattered the lower jaw, the forearm, and the lower "arm" and had apparently hit the heart but not puntured the ventricle. We started intensive care therapy with intranasal oxygen, pain releif, rapid infusion of fluids and osmotic volume expanders, cardiac monitoring and repeated radiographs to monitor the condition of the chest. Duke required constant attention for over 16 hours before we were able to "cage him and cross our fingers". During that time he went into ventricular tachycardia requiring drugs to reduce the likelyhood of fatal arrythmia. It was simply awful but he did start to improve late in the day and was still alive on monday morning. We elected to go to surgery to repair the front leg and the jaw on monday. The humeral fracture was repaired with two compression screws and the ulnar fracture was repaired with an external fixater. The jaw was wired with circlage wire. Duke walked out to go to the bathroom that night and in the morning was actively bearing weight and eating. We were heros again. Weren't we feeling pretty much like we knew which end was up about now. Well, as you might expect, there is more to this story than what we expected. This had been a tough case up to now but Duke was about to test more than our ability. He was going to test our hearts and soul before he was done. I'm sorry that I don't have pictures of most of this but it was during one of my times without a good digital camera and much of the time our spirits were a little low and our inclination to preserve the events for posterity limited. Two weeks after the original event the owner called and said that though things HAD been looking pretty good a few days before but now suddenly the use of the leg had gone down. When I examined the leg and touched the foot Duke tried to bite me. Now, you've gotta understand that this dog would have let me do just about anything to it at the original visit with NO complaint. The foot was very swollen and painful but it felt cold. We could get no doppler pulse. Nothing we did seemed to help. After all that we had been through . . . after the surgeries had worked well . . . something had comprimised the circulation to the foot and we were in trouble. 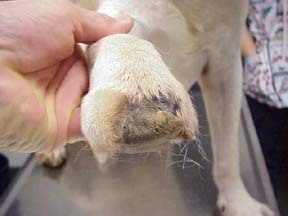 I won't go into ALL of the details but when you lose circulation to the foot you start to have problems with pain, infection and tissue mutilation. Duke was in the hospital for 5 weeks and I spent EVERY sunday morning until he went home shortening Dukes foot. At first it was just the tips of the toes, then the first joint, then the second joint, etc. 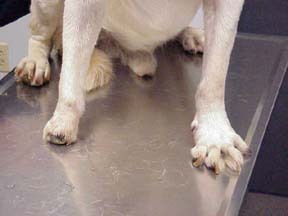 If you haven't seen an animal that didn't have toes to walk on you can hardly appreciate the horrible conditions that can occur. In general if we lose the toes we have to amputate the leg. 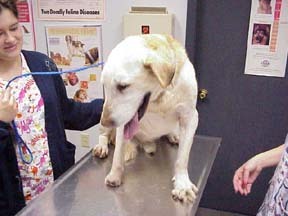 However, that didn't seem to be a good o ption for Duke, an older Laborador with problems with his other legs. In addition to this Duke seemed to be losing his zest for life as we were shortening his leg. The infection was making is appetite very poor. In the end we elected to give things one last chance and cut the foot back to just below the "wrist". The carpal pad seemed to have some circulation remaining and we pulled it over the "stump" We changed the bandage regularly and the wound DID start to heal. We made a "peg-leg" for Duke out of PVC pipe and he used it some but more importantly his spirit started to make a return. Duke went home on December 28, 1998. We did recheck Duke a few times after that and he was coming along well. 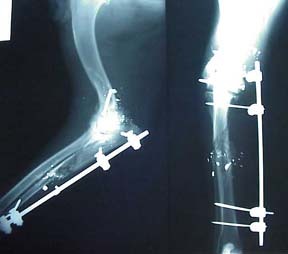 The owners changed bandages for a considerable period of time and the even designed a new "prosthesis". However, in the end an "old timer" suggested that they were making him "weak" by bandaging the foot and they quit. Duke has been on his own since then. If there is anyone out there who actually reads my weekly or bi-weekly postings you know that it's been a little "bleak" and not to Christmas - y around here lately so it was an interesting experience for me on Dec. 23 as Duke came in for his vaccination visit and to board at Four Paws for a week over Christmas. All I can tell you is that Duke is doing GREAT. This is one of those cases that took it all out of us and still seemed to turn south every time we turned around. There were times when it seemed like NOTHING could go right with it. However, when you look back at it it seems like we were SO LUCKY. These are the kind of cases that you HAVE to look as as you plodding through yet another case that looks like it is ready to go down the tubes. If you never have cases like Duke you woud start to give up way to early. As I was walking Duke this morning (Christmas morning) he was jumping all over me and mauling me and licking my face and POUNDING me with that carpal pad stub and that brought a little bit of a tear to my eye because I was ready to give up a time or five with him. So the next time your ready to give up or give in . . . the next time I"M ready to give up or give in . . . try (and I will too) to remember that sometimes you win, sometimes you lose, but you can NEVER win if you don't try. Try to remember Duke the very happy Laborador of Christmas 1999. In Medicine, perhaps more important to me in Veterinary Medicine, it is a "Law" that we ALWAYS lose in the end. None of us or our pets are immortal. We lost a good friend in the summer of 2000 as Duke suffered failure of other organ systems. We will miss him but also always remember him with fondness!